Rich in history and cultural heritage Italy is one of the most visited country in the world, able to offer many photographic opportunities thanks to the stunning landscapes and monuments it hosts. Among the many views and destinations, three cities are usually particularly loved among the visitors: Florence, Rome and Venice. 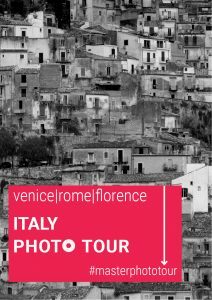 In this eBook we try to tell you more about these amazing cities thanks to the insider view given to us by three professional photographers. Thanks to their ability and artistic view they helped us narrate these destinations through 5 themes we consider particularly relevant and emblematic of Italy and its cultural environment: romanticism, gastronomy, cultural heritage, handcraft and lifestyle. Finally, we wanted to propose you three photo tours, one for each city, entirely conceived and designed by our master photographers. Imagined as maps to help you explore and experience each city in the most original way, these tours want to inspire your photographic adventure. 5 Subjects for each City!